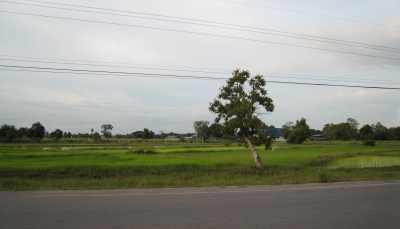 55 Moo 11, Baan Chai-Charoen, Muang Phon-Peg Yai Road (national road 2233), Gao-Ngew district, Phol District, Khon Kaen. Originally the land was an empty field with the soil consisted mainly of clay and prone to flooding in the raining season. Sewage pipe at the front of the temple main road is running from West to East, then turns and goes along the rail line toward La Lerng Wai swamp. 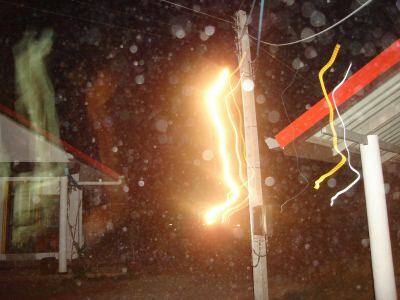 There are water pipes and electrical poles along the main road in front of the monastery toward Baan Peg Yai sub district. The land is about 1 metre below the road. There were a few trees on the land. The monastery is about 600 metres from Phon district office across the rail line toward Baan Peg Yai or Phon prison along highway 2233 Muang Phon-Wang Yai. 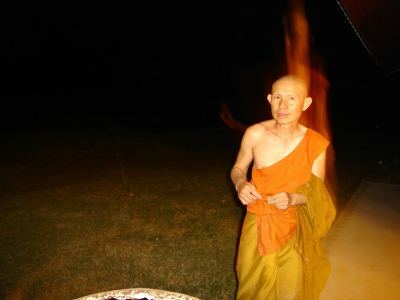 It was in 2006 in my twelfth year staying with Luang Por Prasit Dhavaro, the abbot of Watt Tham Yai Prig on Srichang Island district, Chonburi province. During the whole Buddhist lent period (3 months), it was known that both my mother and father were very old (over 80 years old) and that I should return to my home town to express my gratitude to them. This would allow my parents to make merits in the final part of their life otherwise there may not be enough time. Luang Por Prasit also has a vision before he passed away on 9 March 2007 that I should go to the North East. In January 2008, I returned to my home town to repay gratitude to my parents. They donated a piece of land of the amount of 68,712 square metres or 16.85 acres to build Wiweksikkaram forest monastery. Prior to building the monastery, I lived at Watt Tham Yai Prig and had this vision that I am all alone at an old temple. It is an open field with no building and had 3 jars and I was going to take a bath from water in these jars. I had contemplated and named the monastery “Wiweksikkaram”. Wiwek (deserted or calm) has three parts. Calm body (abstains from 5 Precepts), calm mind (abstain from 5 hindrance) and calm spirit (free from greed, anger, mistakes). Sikka (virtue) also has three parts: Sila (precept), Samadhi (focus mind), Punya (wisdom). Wiwek pairs with Sikka. Calm body pairs with Sila, calm mind pair with Samadhi and calm spirit pair with Punya. Being deserted is a result from practising virtues. Similar to the four noble truths; Dukka (sufferings) is a result, Samuthai (source of sufferings) is a cause, Nirotha (free from sufferings) is a result, Makka (Path to free from sufferings) is a cause. This sums up to cause and effect. Therefore, to avoid the sufferings one must stop the cause (Samuthai) and to be free from sufferings one must follow Makka (the eight Makkas can be summed to Sila, Samadhi, Panya). In naming the monastery, I used the name from Dharma and not a name from a person or location. This is to remind those who come to stay or visit that they should be determined to be free from suffering as my vision had told me. Early in January 2008, the night before my brother took me to view the location to build an entrance to the monastery, I had a vision. There were two opposite arrows and a tall monk (Sikki Buddha) standing where the steel gate is today. I asked him should I walk around him. After contemplation, I decided there should only be one entrance and no access from behind. Another conclusion was that Dharma flow is against the World flow. 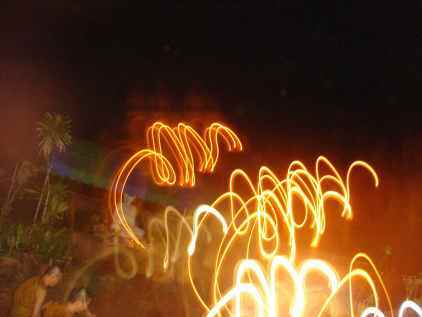 The meaning of the Dharma flow is to do but not to own, to vacate belongings and as a being, be clear, bright, calm and wise. The meaning of the World flow is to do, to own, to be, to grab and to hold. This is blindful, dark, wasteful and ignorance. Therefore, when I saw the location, I decided to make the entrance where it is today. Approval was sought from Gao Ngew local authority to build 8 Kutis (monk’s house). Then an application was lodged to Phon road authority to connect the sewage pipe to the monastery and begin land fill to build the entrance. 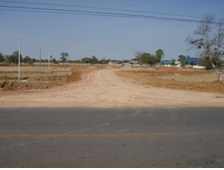 (See above photo for before and after land improvement). On the 22 January, Gao Ngew local authority approved the building application. I then asked for a house registration number from the local district registration office. I received the number is 13, Moo 11, Gao-Ngew district and then used the registration to ask for permission to use electricity from the Provincial Electricity Authority. On the 23 January, electric poles were laid in the monastery and 8 shared bathrooms and 8 Kutis were built. This took place from January to August 2008, as it would be ready for monks to stay during the Buddhist Lent period (18 July). According to Vinaya Pitaka (collection of texts concerning the rules of conduct governing the daily affairs within Sangha), monks must stay inside the temple and not stay overnight outdoors during this period. Sometime later, a builder named Sawang had a dream of coming to build a temple. He contacted me and asked to build the temple from 9 February 2008. Therefore, all supporting factors were ready which allowed the temple to develop quickly: road, water, electricity and builders. On 13 February 2008, an application was lodged to the Provincial Waterworks Authority to connect the water pipe. During that time, theDepartment of Lands was working on land measurement in Gao-Ngew sub district. They came to measure the land at the monastery and issued the title deed on 21 February which was also Maka Pucha day. On the 6 April 2008 (Chakkri day) Pien, a layperson, brought a replica footprint of Sri Mangkala Pacceka Buddha’s right foot to the temple. Two and a half months earlier in 23 January, a picture of a pit and shadow at the corner of the bathroom was taken. The picture looks similar to the replica Buddha’s footprint. Two Phra Sri Maha Pho plants were also donated. 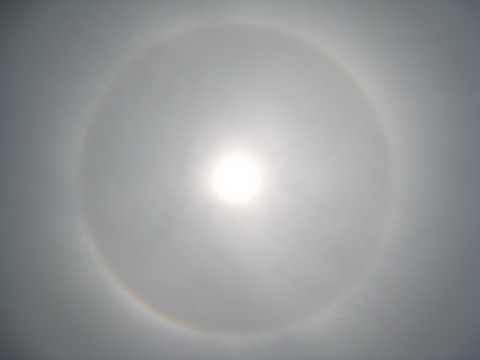 After the donation, there was a Sun Halo for 3 hours (see picture 1). In this year before Ar Sarnha Pucha day, the Sun halo appeared with 3 rings. 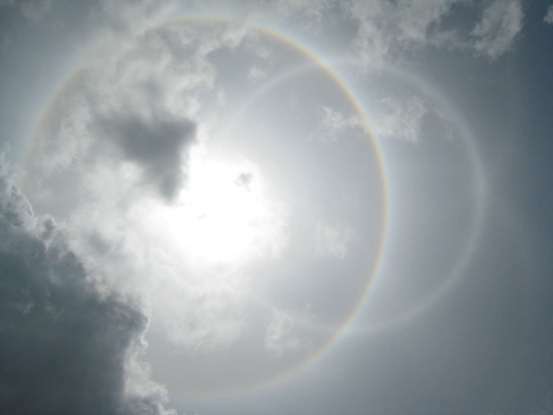 On Ar Sarnha Pucha day, the Sun halo appeared as a Dharma wheel. On 19 July 2008, staff from BT World Lease company ltd. had come to help plant trees and make Sangha Dharn donation. The sun halo appeared from 9 am with 2 rings like the number 8 then moved closer together to become one ring around 12pm and then disappeared. (See photo). 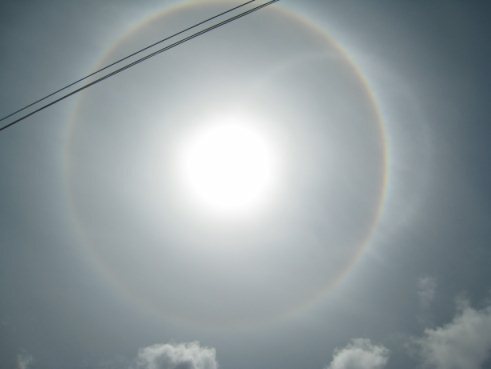 This year the sun halo appeared more than 20 times especially when laypeople came to make special merits (2008-2010). 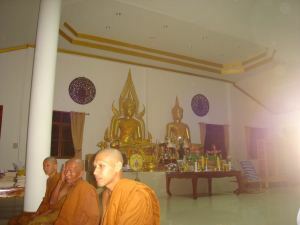 On the 20 April 2008 (Full moon), Mr. Saharaj Taweepong the owner of the replica Buddha footprint had come to make an official offering and also donated relics of the current Buddha. Part of the relics was also donated to Asokaram temple. Mr. Saharaj told me that it was raining on the day he brought the replica Buddha’s footprint to Muang Phol. He was going to take it home but stopped by in Muang Phol to give Pho (a plant) to Mr. Pien. However, when Mr. Pien asked if he had any items to give to a new monastery, he decided to offer the replica of Buddha’s footprint (without telling Mr. Pien that he had it in the back of his car). 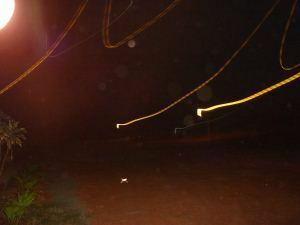 On the 6th of April, it was also rained from 4am until 9am at the monastry. Saharaj told that the Buddha’s footprint was founded at Phu Phan Noi, Phu Phan district, Sakol Nakorn province. The story was Sri Mangkala Pacceka Buddha had arisen 500 years after the end of the Buddhist reign under Kassapa Buddha. After 15 days during nirodha-samāpatti (attainment of extinction of feeling and perception), a hermit asked him to imprint this foot. The real footprint is located under the main Buddha statue at Watt Phra Tart Sri Jam Pa in Pung Clone district, Sakon Nakorn province. This footprint is a replica made from the stone under the real footprint. Since then, there were always offerings of Buddha’s relics, Pacceka Buddha’s relics and Arahant’s relics which was the main reason for building a stupa to keep them. Began building the first kitchen. Began building the back wall from the pond to the eastern side up until the freeway. Began building the library pavillion. Built the rain water tank next to the bathroom by Khun Taweepol Charoenkittikhunpaisarn. Built Palanuphap pavilion and the rain water tank under the pavillion. A layperson from Sydney, Australia offered a Buddha statue in sitting meditation pose base on Sukkhothai era, measureing 59 inches wide. 17 January 2009, Mr. Prompan Assawasangrut offered Chinnaraj Buddha statue, with a width of 59 inces. They are located in Palanuphab pavillion representing Kassapa Buddha and Samana Kodom Buddha. I was not seeking for these two statues and did not know those who offered them. However, I only met them when they came here for the offering. Built water tank and library pavilion and on 12 June 2009 extended the roof of the library to cover the water tank. Began building kuti number 9-11 and a twin kuti number12-13. Began building the front wall from the end of monk's area on the eastern side of the monastery to the entrance. Began building kuti number 14-17. Began building Vihara (house) of Wessabhu Buddha. Monks and laypeople from SongMetta temple in Sattaheep subdistrict, Chonburi province offered a Buddha's statue measuring 2 metres width in first dhama giving form. They asked for a location to be placed and offered the statue on 1 October 2009. The statue was later relocated on top of the platform on 16 October 2009. Then the construction continued on to the roof and other parts of the vihara. Began building the wall on the west side along the road toward the junction to Chinese cemetery. Began building fron wall from the entrance to the end of monk's area in the west. Began building the second kitchen with rain water tank underneath. The power of Pacce Buddha appeared nex to kuti 10. His image appeared similar to when he was alive. This is because there are more than 1,000 relics undergroud in this area. Began to extension work on kuti 18-19. Built SCG rain water tanks. Cement Thai Foundation has donated 100,000 Baht and PT Drive Thailand Co., Ltd donated and installed solar cell on the rooftop. Built sewage with concrete and reinforced steel from the kitchen toward the East, behind kutis and twin kuti to the pond. Sewage was built from the front of Palanuphab pavilion pass the kitchen toward the main entrance. The power of Buddha has shown the location of the Buddha's statue in the 7 Buddha stupa. It appeared as a shadow of Buddha's statue over the earth pile. 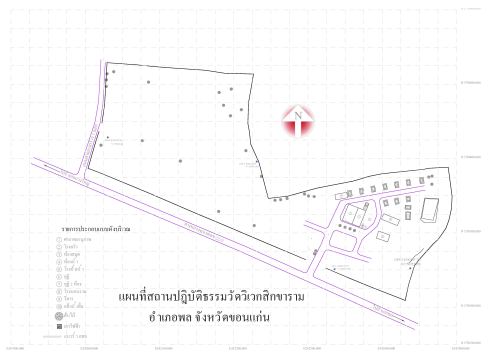 Beside the pile, it is the location where the relics of Wipassi Buddha and Kakusandho Buddha arrived and buried beneath the ground at 7:54pm (See the picture above). Another picture shows the shadow of Buddha's status over Thai number seven telling the name of this stupa to be built. The stupa of 7 Buddhas at 7:58pm. 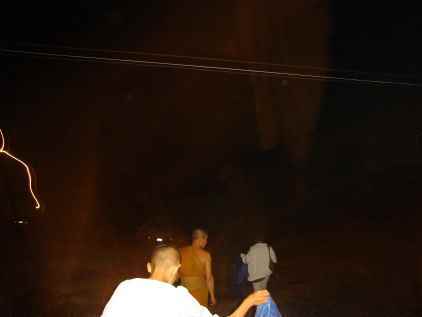 The power of Buddha appeared as walking Buddha ahead of Pha Arjarn Wichai and others at 8:08pm. The picture only shows half of the body due to the size of camera's lens. Began building kuti 21. It is 16 metres long and has 4 bathrooms. Started digging a pond on the monk's area side. It is 23 metres width and 40 metres long. 1st year in 2008 There are 3 monks and 1 nun. 2nd year in 2009 There are 3 monks and 3 nuns. 3rd year in 2010 There are 5 monks, 2 nuns and 1 layperson. This is the first year where 5 monks stayed during Buddist lent period. The first Kathina ceremony was held on Sunday 7 November 2010. Where there is monk, there is temple. Where this is temple that has no monk it is an empty temple. Therefore, one should often listen to dharma and measure one’s mind. Everyone has a duty. Whatever is a good karma, keeps doing it. Whatever is a bad karma abstains from it. The day of fourfold assembly and is also known as Dhamma day. This day marks the great found events that took place during Buddha's life time. 1. 1,250 Buddhist monks came from different places without previous appointment to pay homage to Lord Buddha at Veluwan vihara in Rajgaha. 4. It was the full moon day of the Makha month. Pacceka Buddha, literally "a lone Buddha", "a Buddha on their own" or "a private Buddha", They are said to achieve enlightenment on their own, without the use of teachers or guides, according to some traditions by contemplating the principle of dependent arising. They are said to arise only in ages where there is no Buddha and the Buddhist teachings, the Dhamma are lost. Many may arise at a single time. 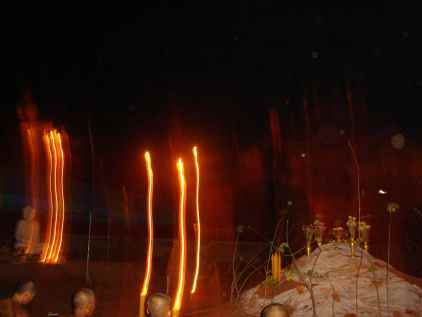 This is the three-month annual retreat observed by Theravada practitioners. Taking place during the rainy season, Vassa lasts for three lunar months, usuallly from July to October. Kathina is a Buddhist festival which comes at the end of Buddhist Lent, the three-month rainy season retreat for Theravada Buddhists. The season during which a monastery may hold a Kathina festival is one month long, begining after the full moon of the eleventh month in the Lunar calendar (usually October). It is a time of giving, for the laity to express gatitude to monks. 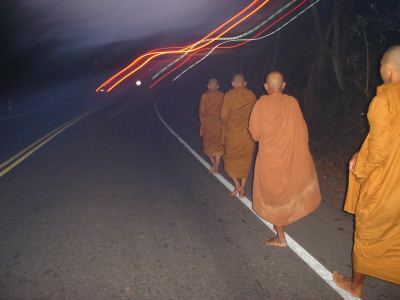 Lay Buddhists bring donations to temples, especially new robes for the monks.